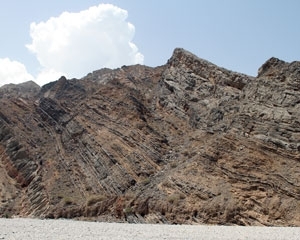 In this rock, different layers and folds can clearly be seen, although not all of them are parallel; some seem to consist of small folds, while others are showing huge structures. Here in the Jurassic (200 to 145 million years old) rock on the opposite bank of the wadi, the smaller folds contain thin layers of rusty coloured sandstone and siltstone, while the thicker bluish layers are limestone. When the rock unit was placed under pressure during the cretaceous around 90 million years ago, the thinner more fluid beds of sandstone have developed into thin tight beds while the thick beds have broader fold structure.